Being a foodie, watching cooking shows it’s such a treat. We sometimes come across several chefs that catch our attention with their particular style but even more so when they use those ingredients that we grew up with and are staples in our Latin kitchens, making us feel closer to home.That is why one to follow is Chef Edgardo Noel. The ingredients he uses and the combinations he creates are an inspiration to think outside the box. The recipes bring our traditional Caribbean dishes to another level. He’s the host of “Cocina al Dia” on the show “Dia a Dia” on Telemundo. He appeared on a cooking reality show called “Operacion Chef”. Chef Edgardo Noel is from Camuy, Puerto Rico and has acquired many years of experience specializing in Caribbean cuisine. He developed a segment with the concept of “Cocinando y Cantando” which means cooking and singing in which He sings different genres of music as he cooks and as it relates to the task at hand. So from a Spanish rap to a traditional “jibaro” tune, he will incorporate it into the meal. Don’t we sometimes do this while we cook? Everything’s better with music! He also owns Servicios Gastronómicos Innovadores, which offers cooking classes, presentations, and catering. Among some of my favorite recipes are his shrimp kebabs with pineapple and coconut, crab stuffed yucca, and shrimp patties. 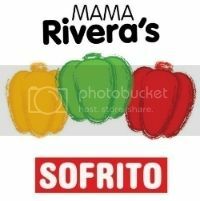 Being Puerto Rican, he uses Sofrito for many of his dishes, which is one item I cannot be missing in my kitchen.